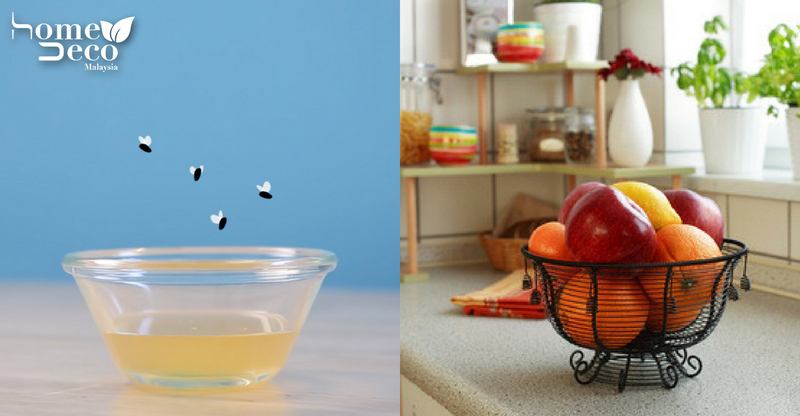 5 Natural Ways To Rid Fruit Flies From Your Pretty Kitchen! Bzzz bzzzz…. House flies are annoying but fruit flies are much more! These tiny bugs appear out of nowhere but they are sure to find your fresh fruits the minute you set it down on the kitchen counters. Somehow fruit flies love the scent of vinegar. Pour the apple cider vinegar into a glass or open the bottle cap, cover the opening with a cling wrap, secure it with a rubber band and poke holes in it. The fruit flies will drop into the container and won’t be able to exit once they are inside. If the fruit flies don’t fall for your first trap, add three drops of dish soap to a bowl of vinegar and leave it uncovered. Dish soap cuts the surface tension of the vinegar and that will cause the flies to sink and drown. Place a bit of vinegar and a chunk of very ripe fruit in a jar. Roll a piece of paper into a cone and stick it into the jar with the narrow opening facing down. This is to draw the flies in and make it difficult for the fruit flies to get out. Simmer a pint of milk, 4 ounces of raw sugar and 2 ounces of ground pepper for 10 minutes. Pour the mixture into a shallow dish and watch the fruit flies quickly drown. Add a few drops of dish soap if the flies seem to be getting away. If you’re willing to sacrifice one of your reds, leave the bottle out in the open. Apparently, the skinny neck of the bottle keeps the fruit flies trapped.